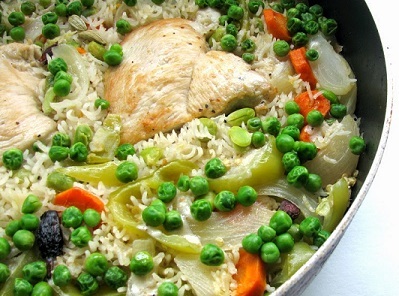 One taste of this delectable Chicken Rice Skillet Recipe and your friends and family will thank you - the chef! This easy chicken recipe is popular with people of all ages and it is a very healthy dish. The recipe is very flexible in terms of the ingredients you use. I like making this meal using chicken stock, but you can substitute cream of chicken soup, or cream of mushroom soup or cream of celery soup if you prefer. 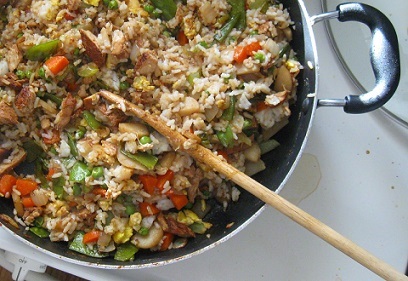 You can also add or substitute your favorite vegetables for this recipe. Sometimes I use sugar snap peas or sliced mushrooms or small broccoli florets. I often use Basmati rice for this recipe, but again, you can use whatever rice you prefer or have on hand. Use a spoon to portion onto plates and serve immediately. 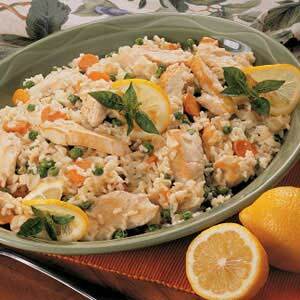 Enjoy your restaurant chicken rice skillet recipe and the company of those you share it with! Did you know? Arkansas is the largest producer of rice in the U.S. accounting for almost half of U.S. rice production.